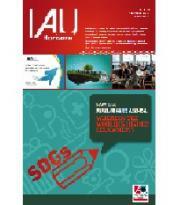 IAU Horizons 20/3 focuses on "Where In The World is Higher Education in the Post-2015 Development Agenda?" Launched at the UNESCO World Conference on ESD in Nagoya the issue offers a series of 18 papers on why higher education plays a crucial role in addressing the challenges of today and tomorrow. The issue is available online. Do not hesitate to circulate broadly!